Approach to Trailhead: Gary Yngve, Dan Goering, Russ Schwartz, and I hit the road 5am Sunday. We parked at the Alpental ski area and started up around 6:45am, the stream on our left. We quickly realized we needed to be on the other side. We found an acceptable log to cross, with some three feet of snow on top. Dan tossed his skis and poles across and successfully crossed after them. I followed, but with my horrible aim managed to have one of my poles slide into the stream. Dan rescued it while I crossed the log. 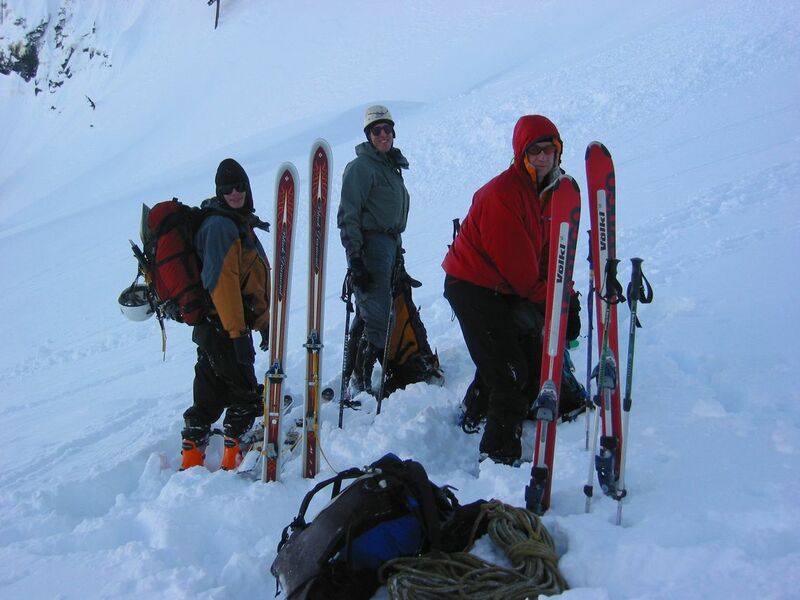 Russ and Gary followed, with Russ narrowly missing being hit by one of Gary's skis, and Dan needing to rescue one of Gary's poles from the stream. This got us back on the road leading to the higher parking lot and the trailhead. Phew. Who knew getting across a ski resort would be so hairy! Crossing the stream on a log, during our approach to the trailhead. Approach to Climb: We were all on AT skis. The ascent was mostly uneventful. Gary lost part of his Dynafit binding (the heel), but Russ noticed the detached piece and Gary was able to screw it back on. The trail starts out as a groomed cat track, then a trail, and eventually a line of snowshoe prints to the top of the ridge. We crossed paths with some fellows heading up the Tooth; a man with a prosthetic arm and a very happy black lab; and half a dozen skiiers on a guided trip with Pro Guide. Ascending on skis. An intermediate point along the approach. Note the gorgeous weather. 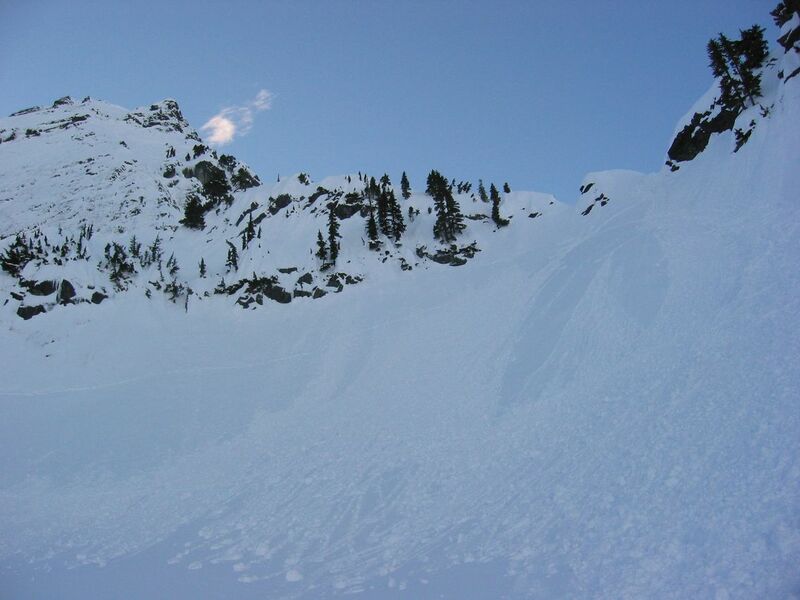 We left our skis at the bottom of the basin beneath Chair Peak and ascended the ridge. 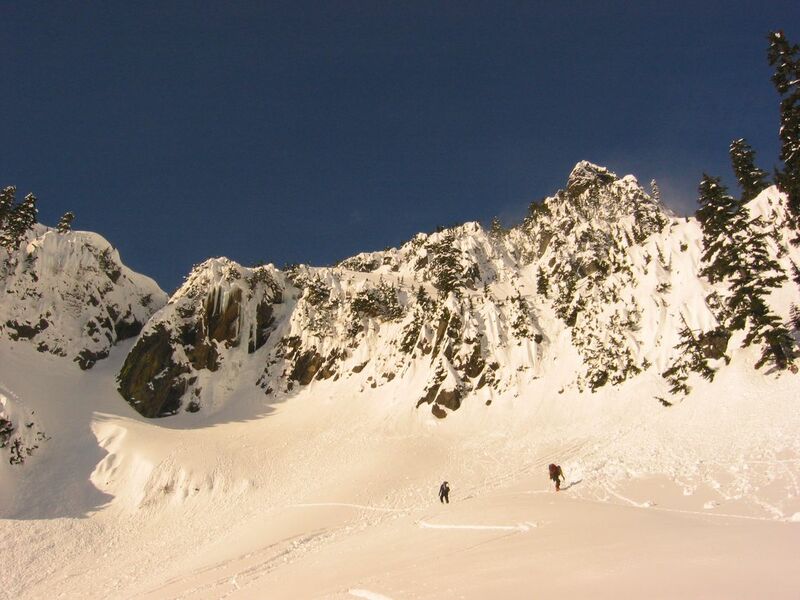 Our goal was the summit of Chair Peak, via the North Face. As we contoured from the ridge towards the route, Dan came across a slab that seemed to have a lot of air and ball-bearing-like snow beneath. It looked like the lower part of it had already broken off. We decided that crossing beneath it was still sketchy. Furthermore, since it was on the same aspect as our route, the route might be in similar shape. We changed plans to the nearby and quite similar North East Buttress. We did it in three pitches. Dan lead and Russ followed on one rope. On a 2nd rope, Gary lead in Russ's footsteps reusing some of Dan's pro and placing some of his own, and I followed. 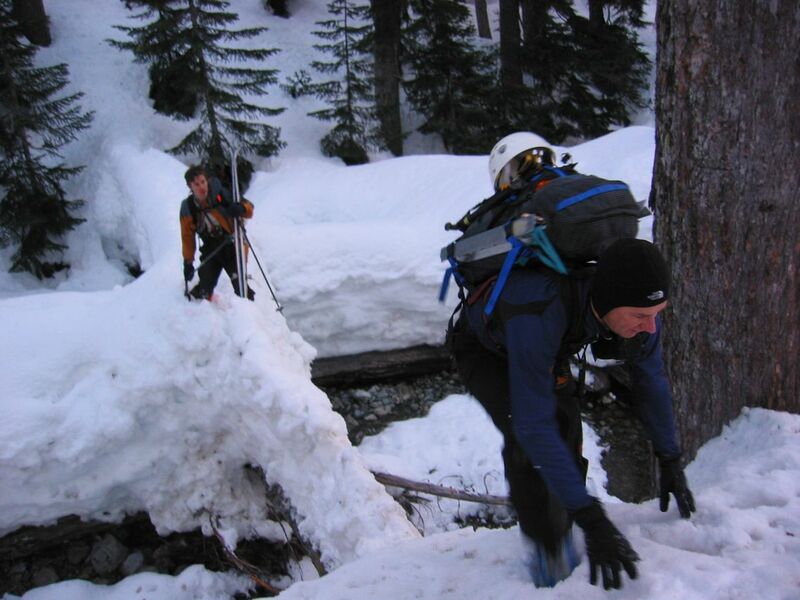 Left: Descent down snowy gulley. 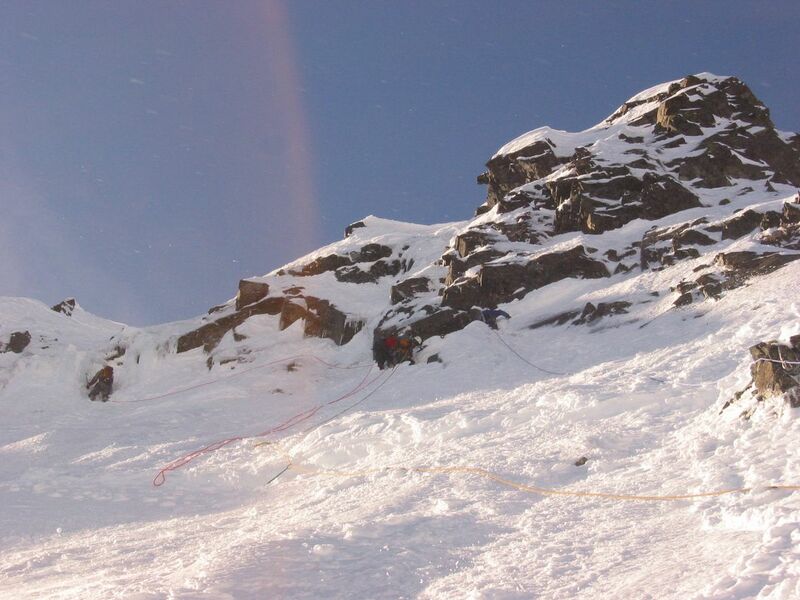 Right: Ascent to ridge. Photo taken from where we left our skis. The technical climbing began not much higher than the ridge to which we ascended (in the right photo). Pitch 1: 65-70 degree ice and neve. A buried picket for an anchor at the bottom. Kind of cold for me, waiting in the wind for all three of the guys to head on up before my turn climb. The pitch was hard snow or soft ice, the kind where the pick of the axe sinks in an inch. Dan placed one marginal screw and a nut along the way. Gary didn't see the one crack in the one rock for the one nut, so he soloed the whole pitch. Gary got to within about 5ft of the next belay (a tree) when he ran out of rope, so we simuled that wee bit, apparently with no pro whatsoever between us. Pitch 2: 40-50 degree snow. Nice views. Lots of wind carrying fine ice crystals. I don't know what a beauty salon would charge for such excellent exfoliation! We simul-climbed a big chunk of the pitch. The top anchor consisted of a fixed pin, a nut, and a tri-cam. Another group used another fixed pin and a cam. The two anchors were linked as backup. 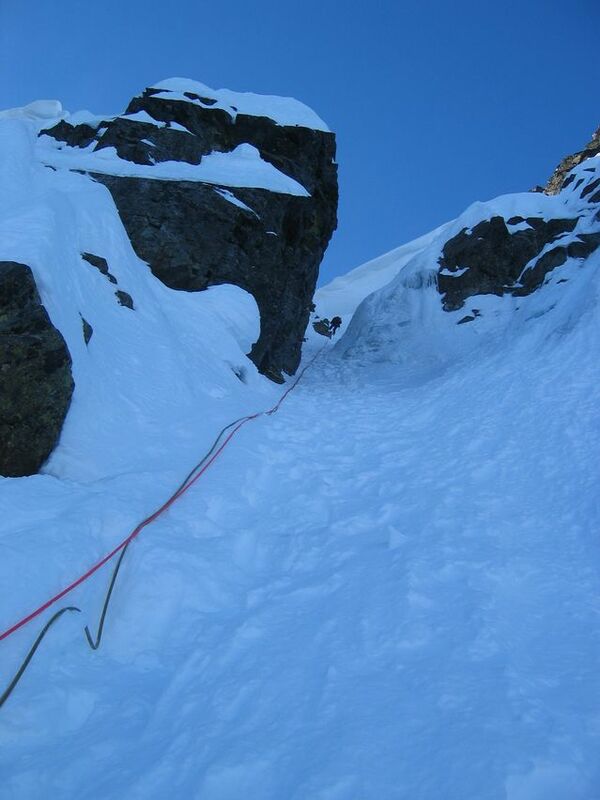 Pitch 3: A short loose snow traverse. Then a short vertical section of water-ice. It felt like 5.10 stemming to me (gym junkie, ice newbie). I'm glad I didn't know Gary and I were simul-climbing when I went up that section, or it would have made me nervous. 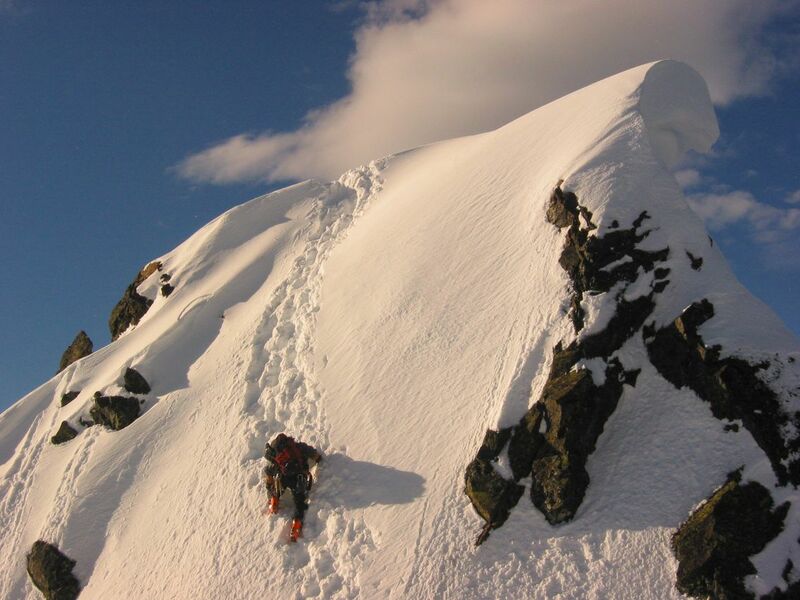 Then more steep hard snow to the sub-summit. Dan (on left) starting on the short water-ice section of pitch 3. Gary and Russ at the rock anchor atop pitch 2. Photo shot from about half-way up pitch 2 (we were simul-climbing) as I twiddled my thumbs while they boys mucked with the anchor. The top: Awesome views all around, with visibility as far as Baker. We left our packs and ropes at the top anchor and climbed up to the summit. 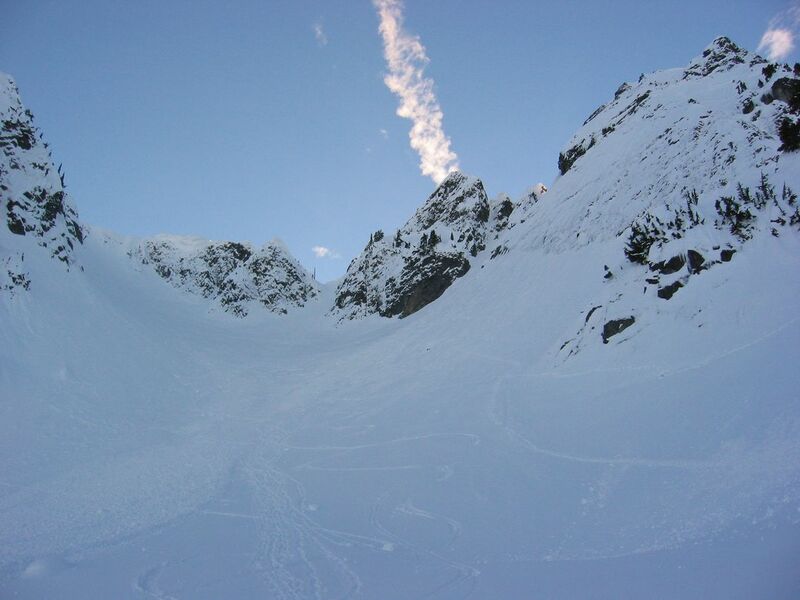 The cornice on the summit looked really quite beautiful from below. Descent: Rap down a gulley on three fixed pins. Plunge-step the rest of the way down to our skis. Ski down the ice (the nastiest stuff I've ever skiied) to the trail. Fun skiing down the rolling trail and cat track to the trailhead, though. Double-rope rappel from three fixed pins. Lost Boy: On our way out, still some 45 minutes from the trailhead, Dan and Russ (who were ahead) found a boy, about 16 years old, calling "Dad! Where are you?!" He was cold and scared, and mentally not quite there. He said his dad had told him to wait there. It was about an hour before dusk, so Russ talked him into walking out with us. Dan waited for me to catch up to let me know what was going on. I dug out my cell phone and called ski patrol (911 who then connected me to Snoqualmie security) and told them what was up. Dan skiied on down while I repacked my pack. As I was finishing, a fellow appeared over the ridge above and I asked him whether he was looking for a 16 year old boy. He said yes, and seemed rather upset. I told him what was going on and (unfortunately and stupidly) used the term "mentally retarded," which is non-PC, in sensitive, and wasn't necessary anyway. My mistake. The unfortunate comment only served to turn more of his frustration at me or our party. The man continued down at a good clip, and with the icy snow conditions I descended about equally quickly on skis. I skiied out first and as expected was met by ski patrol at the trailhead. They called off the search party that had been sent out looking for the dad. The boy's mother was also there. I had not told ski patrol any names, so she must have been worried and contacted them independently. Russ, Dan, and Gary came out next. The dad had caught up just a few minutes from the trailhead and came out with his son a couple of minutes later. The mother asked: "What happenned?" The father answered: "Nothing. They made a big deal out of nothing." The mother was grateful to us. The father seemed angry at us and/or himself. The boy seemed relieved to be out, but mostly unaware of the potential danger of the situation. Ski patrol debriefed us at the trailhead and let us go. They asked the boy's family to stop in at the first aid office for their debriefing. The boys. From left: Gary, Dan, Russ.